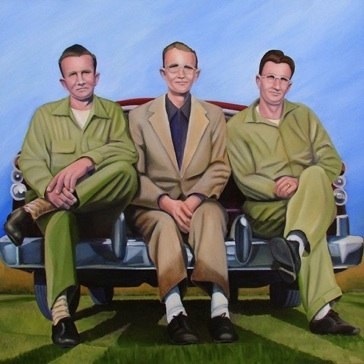 This painting isn’t so much a portrait of these three men so much as its a composition of three figures placed in a square shape. The lines of the shadows and the underside of the vehicle provide a perspective that keeps the background from being a flat backdrop. The representation of the figures has a more “mural-esque” styling (I kept thinking about the WPA art that was created back in the 1930s) that suggests a concept without telling a specific story. Based on a small, B&W photo some 60 years ago, I kept the most interesting elements to make this painting.